Soups are pretty mundane. They don’t garner all the razzmatazz that entrees do in a fancy restaurant. Soups sit quietly in the back row, never speaking unless spoken to. I think of soups as kind of shy. They mind their own business, but if you seek them out, well then….they love to be noticed, and they can charm you, but quietly. 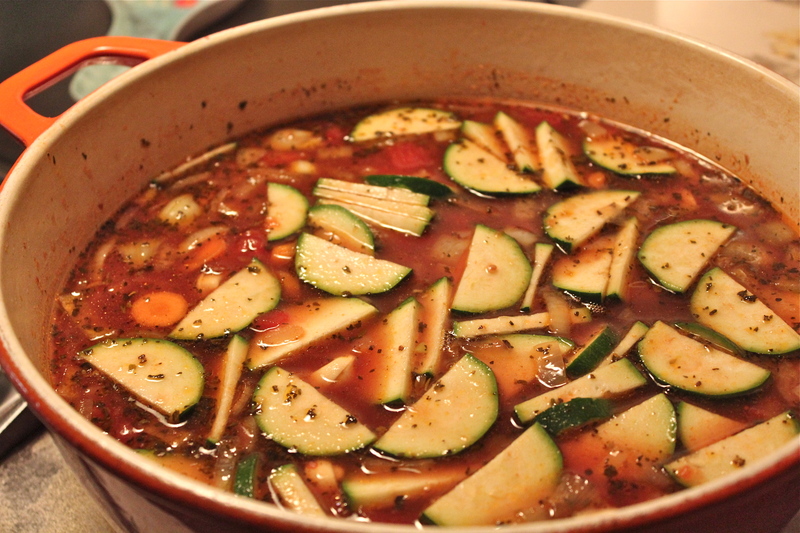 I made this soup on a day when I needed soup….and on a day when I needed the soup to be easy, but captivating. This is a soup that shines when you taste it, but not before. The savory onions and garlic go from sautéing, into a pot of hot broth, to which diced tomatoes are added and the seasonings. Add some fresh cheese-filled tortilini, cook a few minutes till done, add some spinach, and there it is. The dried basil and oregano are essential. 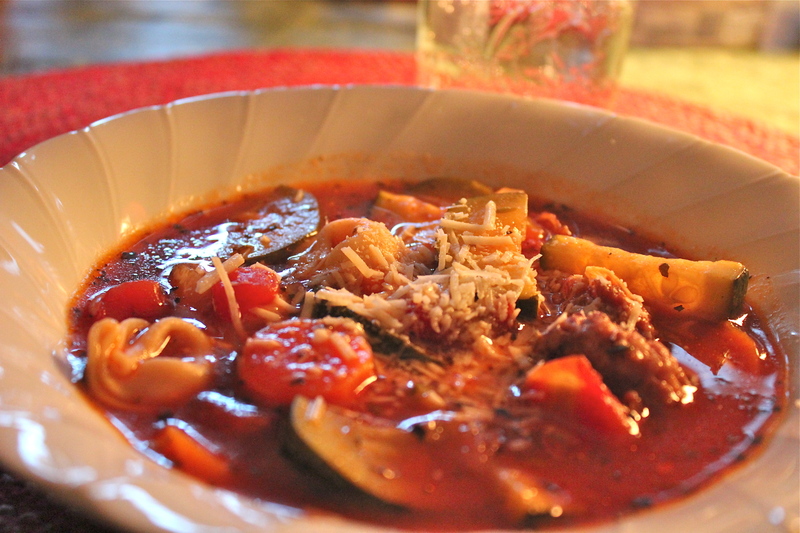 They are what makes this soup have that wonderful Italian flavor. The only thing that can make it better is a shaving of Parmesan cheese on top. Oh, and a loaf of crusty, crunchy bread to soak up the broth. Listen closely, and you will hear Andrea Bocelli singing. 1. Heat the olive oil in a large soup kettle. Add chopped onion and garlic and cook until the onion is translucent. Sautéing the onions and garlic. 2. Add the tomatoes with their liquid, the chicken broth plus 1 cup of water, all the seasonings, the tortellini and salt and pepper to taste. There’s all those lovely seasonings. 4. Stir in the spinach and cook for 2 – 3 more minutes to heat through. 5. Ladle into bowls and serve with shaved Parmesan cheese as garnish. 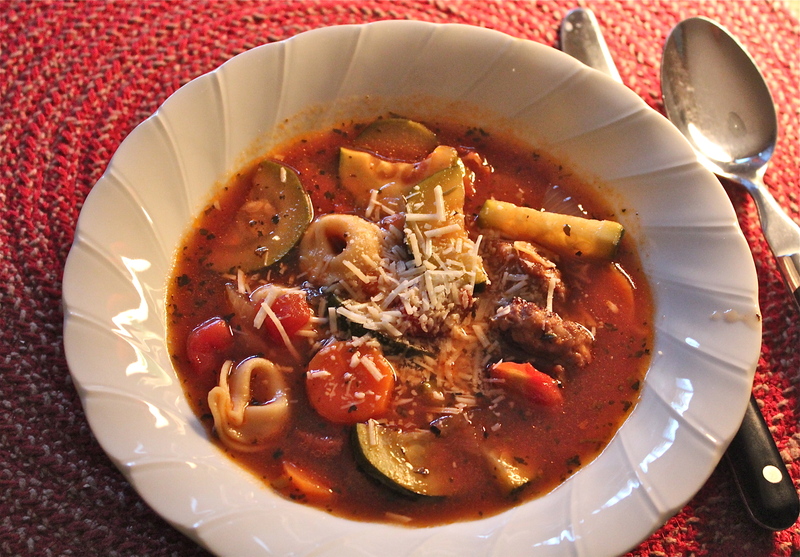 Italian Sausage and Tortellini Soup. I would love to travel one day to Italy and totally absorb the culture, and especially the foods. My preference would be to visit the small towns and villages and experience life as the Italians do. I could imagine stopping for lunch at a trottoria, sitting outside at a small table on a terrace and enjoying a special soup with some wonderful crusty bread and cheese. This is the soup I could imagine having in that kind of setting. For anyone not familiar with the pasta called tortellini, they are crescent shaped and filled with meat or cheese. You can purchase them in most large supermarkets as fresh pasta in a refrigerated case or dried and shelf stable in the pasta isle. I like to keep a package of the dried variety on hand to throw into soups or casseroles, because they provide interest and extra substance, just as they do in this soup. A hearty bowl of goodness. The book I took this recipe from has been around for a long time; from Pillsbury, ” Hearty Soups and Breads Cookbook”, 1985. 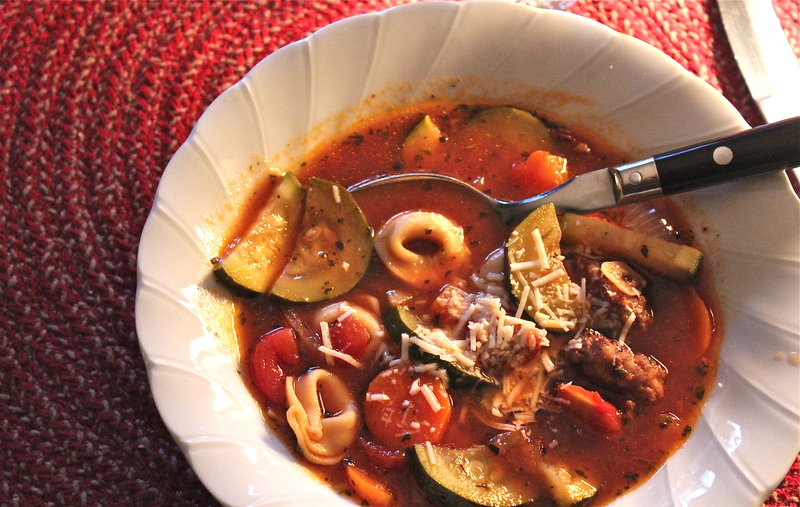 The first time I made this soup we fell in love with it, and it has been in my repertoire of well-loved recipes ever since. 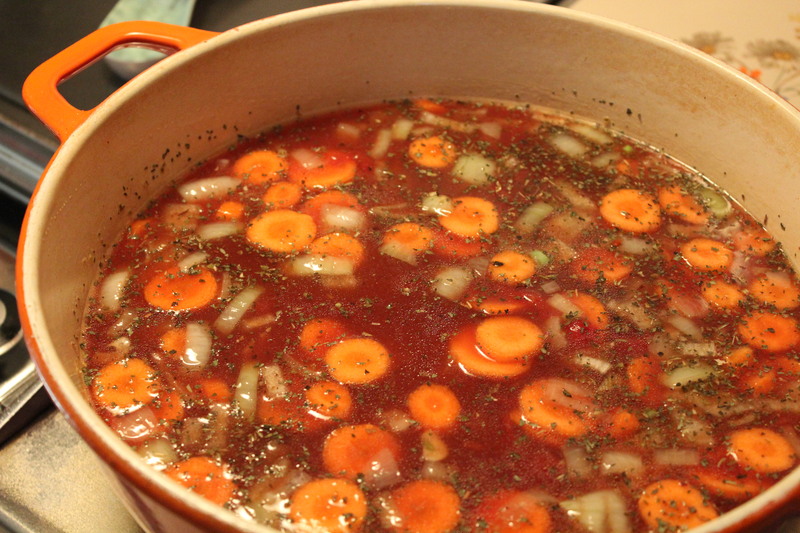 It is very hearty with lots of vegetables and the blend of seasonings makes a well-flavored soup. 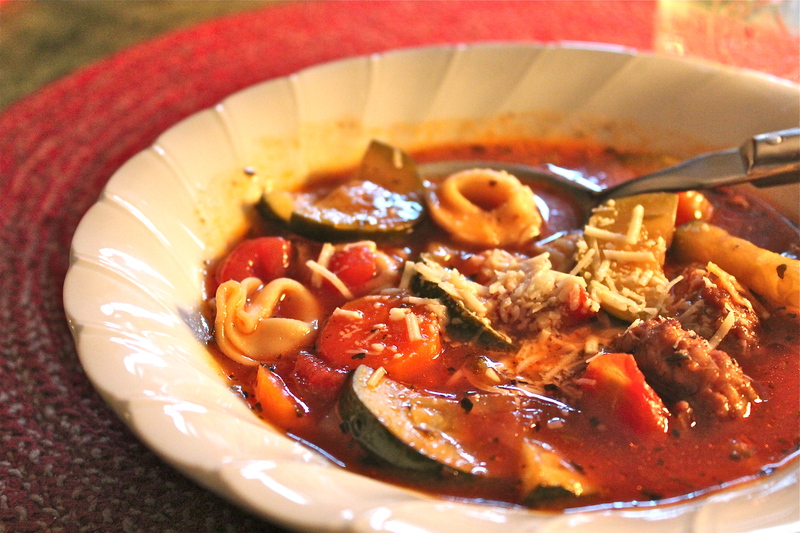 If you like a spicy soup, use a hot Italian sausage, instead of the mild variety. The recipe makes a large amount, about 8 servings, but it freezes well, so its good to make and freeze some for a later meal. 1. If sausage comes in casing, remove casing. In 5-quart Dutch oven, brown sausage. 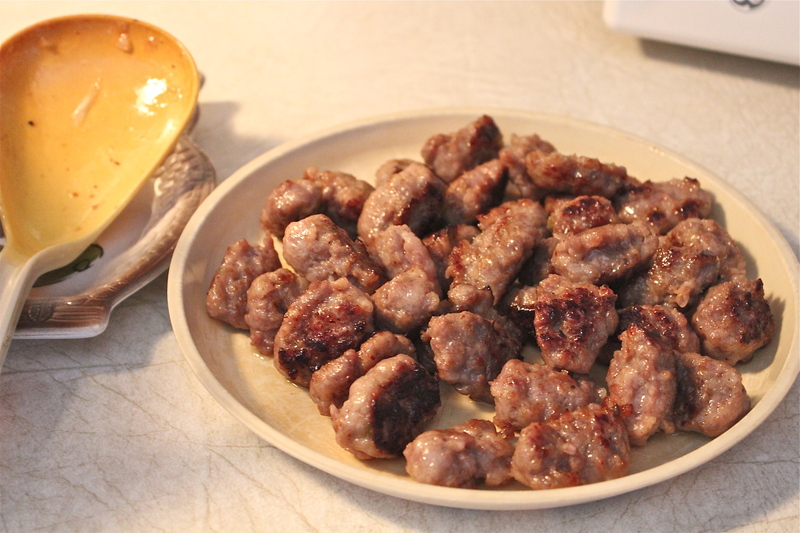 Remove sausage from Dutch oven; drain, reserving 1 Tablespoon drippings in the Dutch oven. Brown sausage and remove from pan. 2. 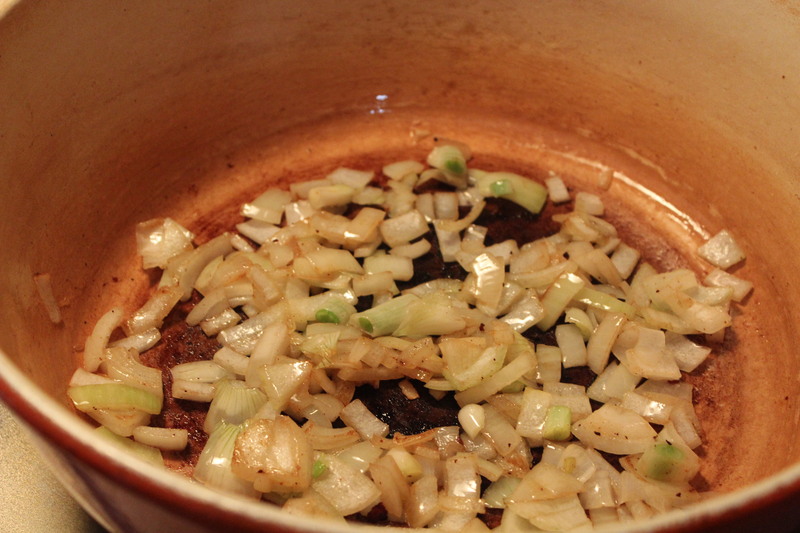 Saute onions and garlic in reserved drippings until onion is tender. Saute the onions, till soft. 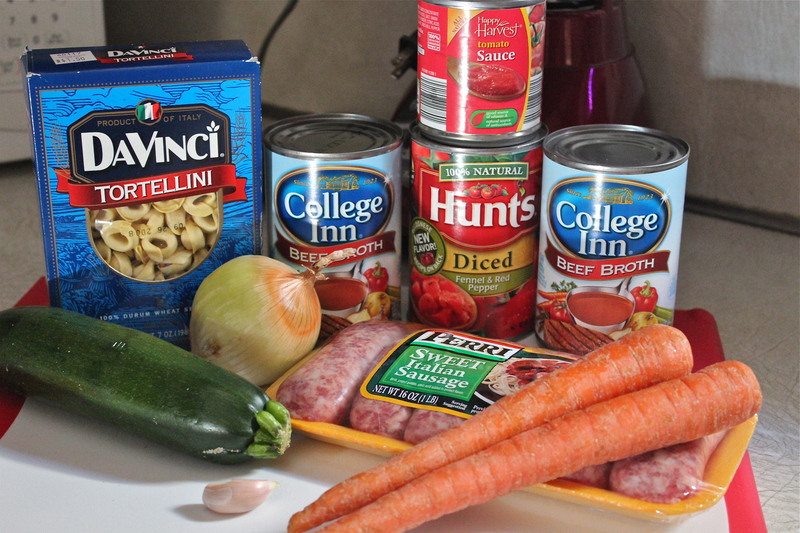 Add beef broth, water, wine, tomatoes, carrots, basil, oregano, tomato sauce and sausage. Bring to a boil. Reduce heat; simmer with lid tipped, 30 minutes. Add the liquids, vegetables and seasonings. 3. 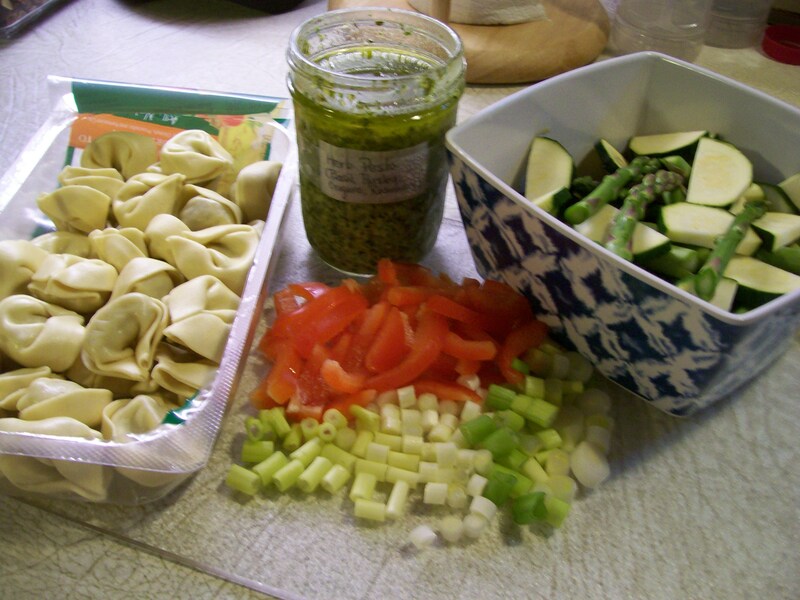 Stir in zucchini, tortellini and parsley. Simmer another 35 – 40 minutes until tortellini are tender. 4. To serve, sprinkle with Parmesan cheese. Make this soup. You’ll be glad you did. Most of us love pasta with red sauce. They go together like peanut butter and jelly, or iced tea with lemon. But let’s face it when the days are beautiful and warm we’d much rather be outdoors than in the kitchen making the sauce, cooking pasta and eating a heavy, hot meal. Right about now I’m lightening up our meals, and including as many fresh, seasonal, vegetables as I can work into our diet. Pasta(s) still have their place, but are used a little differently. The pasta assumes a secondary role rather than being the main focus. 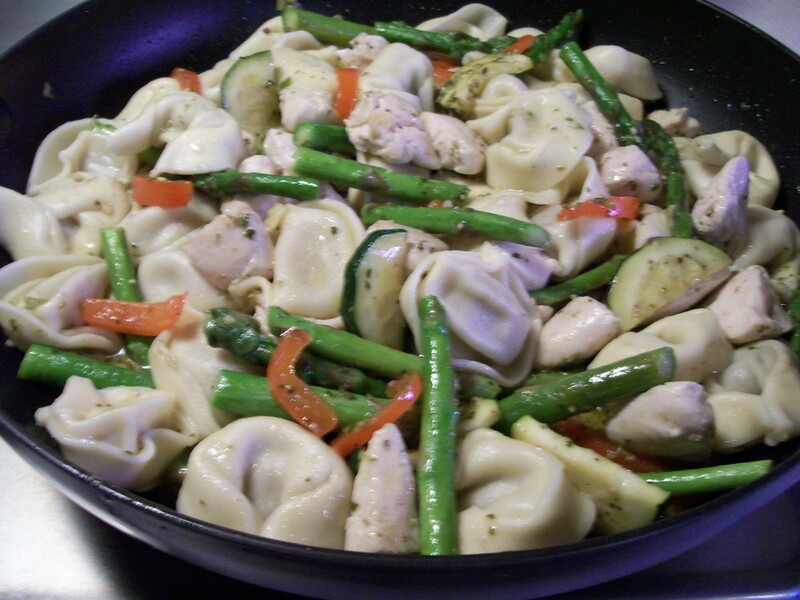 In this recipe chicken and vegetables are the main focus and tortellini helps round out the meal for an all-in-one-pan entree, quick and easy to prepare. 1. Prepare tortellini according to package directions. 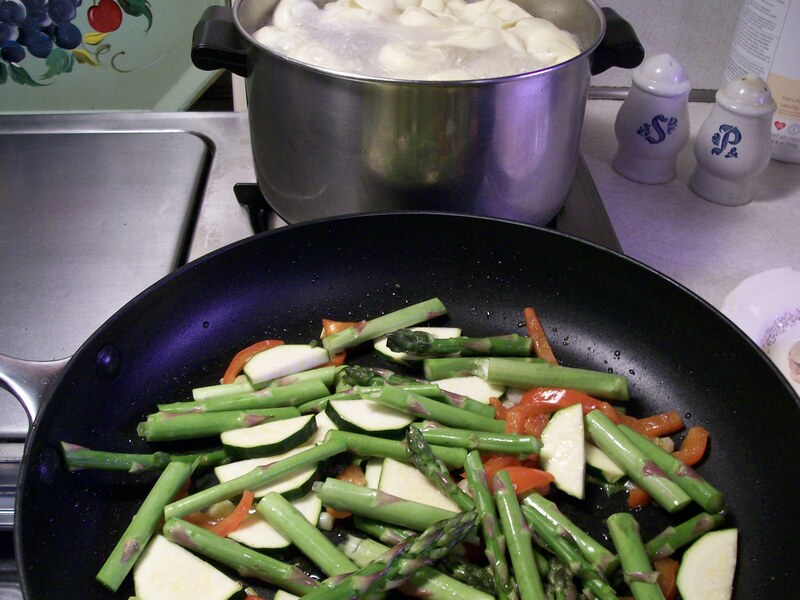 Meanwhile, snap off and discard tough ends of asparagus, and cut the asparagus into 2-inch pieces. 2. Season chicken pieces with salt and pepper. 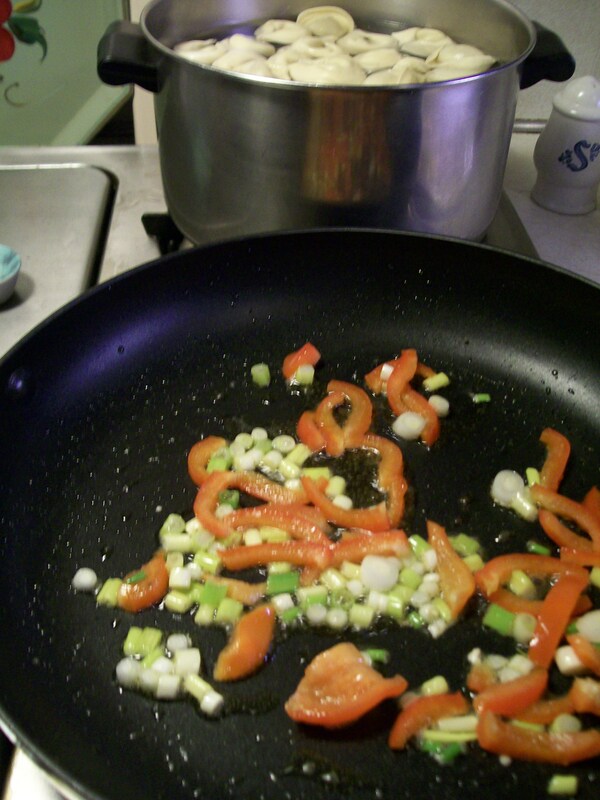 Saute in hot oil in large skillet over medium-high heat 6-7 minutes or until almost done. Remove to a platter and keep warm. 3. In the drippings remaining in the skillet, sauté the onions and red pepper over medium heat 1-2 minutes or until softened. 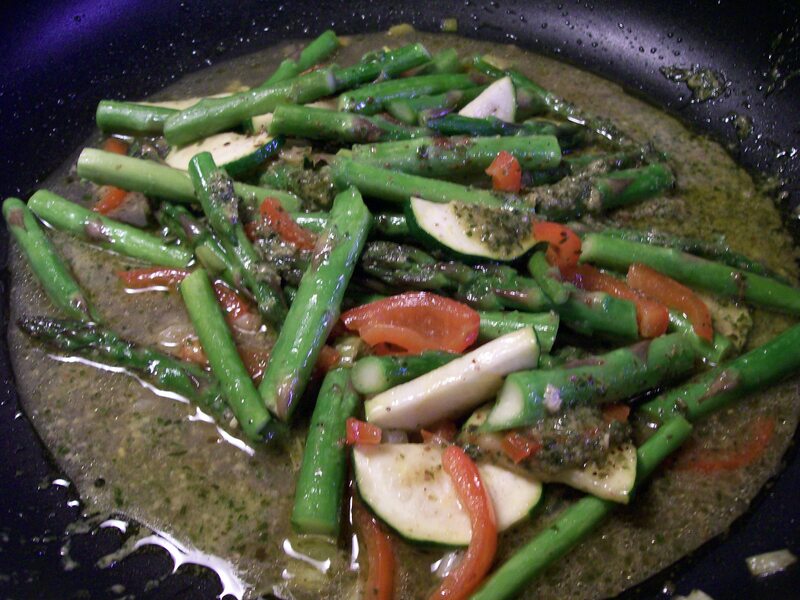 Increase heat to medium-high, add asparagus and zucchini and sauté 5-6 minutes. 4. Stir in pesto, and return chicken to skillet. Cook, stirring occasionally, 2-3 minutes or until thoroughly heated. Save aside about 1/2 cup pasta cooking water. Drain the tortellini and add to skillet with additional cooking water to loosen the sauce as desired. Sprinkle with Parmesan and sliced black olives if desired. Serve immediately.